One more variation on stir-fried squid. This time i added an excellent thick cut bacon. Couple of squid cooking tricks i learned from somebody. 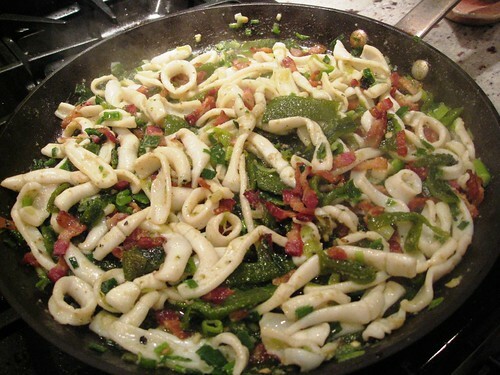 Cut the squid in strips, put them into a bowl, add lemon juice and then olive oil, stirring until emulsified. 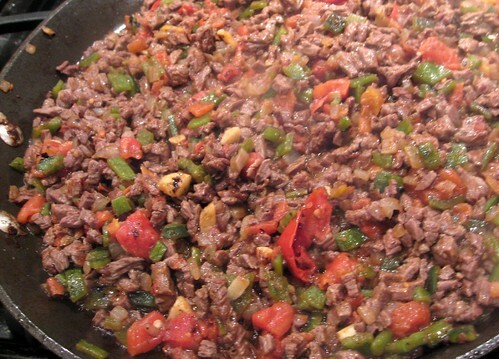 At this point i usually add some flavorings – onions or other vegetables. This time roasted poblano and scallions. In the meantime rendered most of the bacon fat, removed it and added the squid mixture. Stir-fried it for several mins and then put the bacon back. Voila! Very quick and a great flavor. Tiny dice of skirt steak flavored with poblano, dry roasted garlic, fire roasted tomatoes, oregano, and some chipotle, very subtle. served with charred scallions, sprinkled with salt and lime juice; cabbage/carrot/pickled serranos slaw, panela.